The Leningrad Region has signed a strategic agreement on construction of a multipurpose deep sea port facility, Primorsk Multipurpose Transshipment Complex, says press center of Leningrad Region Government. 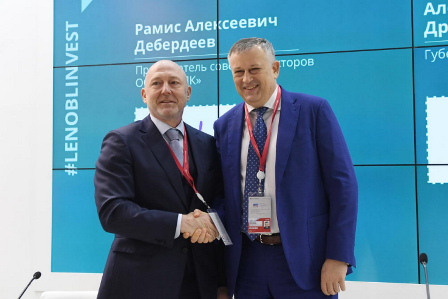 The document was signed by Alexander Drozdenko, Governor of the Leningrad Region, and Ramis Deberdeev, Chairman of Primorsk Multipurpose Transshipment Complex BoD at the Russian Investment Forum. Investments into the project are estimated at RUB 90.6 billion. The facilities of Primorsk MTC are to be put into operation in 2022. When completed, the complex is to have annual capacity of 70 million tonnes. The new port facilities will handle coal, mineral fertilizers, containers, general cargo and grain. When put into operation, the complex will generate 3,130 new jobs. The facilities will cover a territory of about 780 hectares. The project on construction of a multipurpose deep sea port is to be implemented in the Vyborg District of the Leningrad Region in compliance with the strategy on taking over Russia’s foreign trade cargo from the ports of the Baltic states. According to Alexander Drozdenko, that territory is to be granted a status of a special economic zone. The project approved by the Federal Marine and River Transport Agency is included into the Strategy for Social and economic development of the Leningrad Region through 2030 and long-term development programme of FSUE Rosmorport till 2020. Port Primorsk is Russia’s largest oil port in the Baltic Sea. It is the final stage of the Baltic Pipeline System (BPS). The port is located in the Leningrad Region, on the eastern coast of the Bjyerkezund Strait (Gulf of Finland of the Baltic Sea). The port can accommodate vessels of up to 150,000 DWT. Annual throughput of the port is 60 million tonnes.